If you want to give your salad a special, fresh-from-the-garden appeal, you won't dig up anything better than this tasty serving dish. It takes the familiar form of a garden wheelbarrow, with a silver-plated basin and two serving tools shaped like a shovel and rake. The wood accents, including its functioning wheel, are made from sheesham, a variety of rosewood which is renowned for its intricate, marbled grain. Whether you're serving food, holding garden-fresh fruits and veggies, or simply putting it on display, this bowl is sure to be your favorite pick of the season. Made in India. Fabulous product. You can't get a huge salad in this for lots of people but would still recommend. It really stands out on the table. It's a great conversation piece and would be a timeless piece. Loved the concept and the serving utensils were great. The wheelbarrow bowl was way too small - single salad serving size. Returned because of impractical size. Very cute wheel barrow but much smaller in person than it seems online. It looks like a garden ornament rather than a serving dish. It is hardly big enough to serve a salad for one person - definitely too small for entertaining. I bought this as a gift and am returning it. First, your dimensions are incorrect. The whole piece is 17" long x 7 3/4 " W x 7 1/4" H. The serving portion of this is (and this is the important dimension if one is to use it as a serving piece) is 11" L x 7 1/2" W x 3 1/4" H. Not much salad can fit in this! This is described as a serving dish. Focusing on product performance as you suggest, I offer the opinion that it would be difficult at best to put salad for ONE in this cute wheelbarrow, much less use it as a serving piece. Great description,interesting concept; however, does not fit the item. it could be a display item, but that is not how you are marketing it. 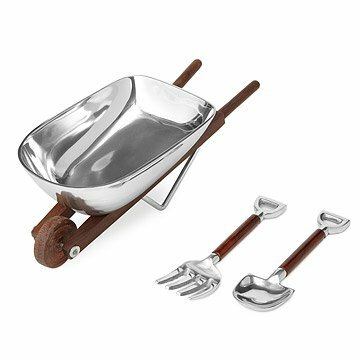 This silver-plated salad bowl, with carved sheesham wood accents, is shaped like a garden wheelbarrow, with shovel and rake serving utensils.